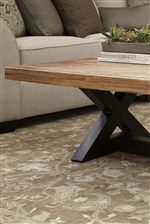 Rustic casual design makes this rectangular cocktail table a standout despite its simplicity. Featuring a mango wood top in a light natural finish, the black rustic finish of the X-braced base creates a two-tone style with ample charm. For a modern farmhouse look to a vintage inspired decor, this coffee table will be a fantastic centerpiece for your living room. The Wesling Rectangular Cocktail Table with Mango Wood Top & Metal X-Braced Base by Signature Design by Ashley at Beck's Furniture in the Sacramento, Rancho Cordova, Roseville, California area. Product availability may vary. Contact us for the most current availability on this product. Keep it casual with the modern rustic appeal of this occasional table collection. Each piece available offers a great two-tone design with a mango wood top in a light natural finish to contrast nicely with a rustic black finish over an X-shaped metal base. The Wesling collection is a great option if you are looking for Relaxed Vintage furniture in the Sacramento, Rancho Cordova, Roseville, California area. Mango Wood Table Tops. X-Shaped Metal Bases in Black Finish. Browse other items in the Wesling collection from Beck's Furniture in the Sacramento, Rancho Cordova, Roseville, California area.